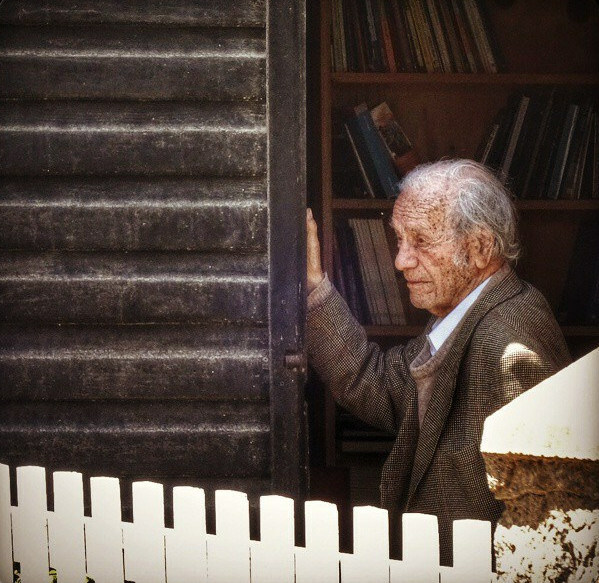 Nicanor Parra (1914-2018) was born in a poor but a family of famed artists and writers in Chile. His father Nicanor Parra, a primary school teacher and musician, and mother Rosa Sandoval a seamstress fond of folk music, gave their children a culturally stimulating environment in the household. From an early age he devoured the modernist Chilean poets like Manuel Magallanes, but when he moved in 1932 to Nacional Barros Arana high school, in the capital city Santiago for secondary education on a scholarship, his literary affinity blossomed in the company of Jorge Millas, Luis Oyarzun and Carlos Pedraza. At this boarding school, he began his tryst with the ideas of Anti-poetry – developing a distaste for the usual poetic pomp, breaking away from conventional norms of traditional poetry. In 1933 while studying at the Teachers Training College at the University of Chile, along with his friends, he founded Revista Nueva magazine. Here he would publish in 1935 his first short story Gato en el Camino (A Cat In The Way) at age 21. It was an anti-cuento (anti-short story). He moved on with his career as a Math and Physics school teacher alongside publishing his first poetry collection, Cancionero Sin Nombre (A Songbook Without A Name). It appeared in 1937, influenced by Garcia Lorca’s Romancero Gitano (Gypsy Ballads 1928). The collection was praised by Gabriel Mistral, the great Chilean poet who would receive Nobel prize in 1945, and also won the Santiago Municipality award. Meanwhile, Parra received a scholarship offered by the Institute of International Education in 1943 and joined Brown University to study Advanced Mechanics. And then Cosmology at the University of Oxford and he thereby continued teaching Theoretical Physics at the University of Chile till his retirement in 1991. His poems, even today, hit like a rock to the hypnotised poetry readers and awakes them with language adorned by humour, irony, sarcasm and an antiheroic tone. Harold Bloom calls him undoubtedly one of the best poets of the West and as ‘‘essential’’ as Walt Whitman. Parra translated Shakespeare’s “King Lear” into Spanish and the beatniks Ginsberg and Ferlinghetti translated him into English. He influenced myriad of poets in and outside Spanish speaking world. The genre of Akavita in Hindi could be one of the fascinating examples. Three times nominated for Nobel prize, Parra said, “If they did not give it to Juan Rulfo, I do not see why they would give it to me” For Bob Dylan, he said back in the year 2000, he deserved Nobel for these three verses. He won the Chilean National Literary Prize in 1969, Juan Rulfo prize (Mexico) in 1991, Queen Sofia Iberoamerican Poetry Prize (Spain) in 2001. And in 2011, was awarded the Cervantes Prize, the Spanish-speaking world’s highest literary honour which he did not come to receive and sent his grandson. An anti-establishment or a free spirit par excellence, he never joined the established right, left or centre and fought for reason throughout his life. In 1989, he visited India to participate in the The Vagarth World Poetry Festival, a centenary tribute to Jawaharlal Nehru, held at the Bharat Bhavan. He was joined by other veteran poets; John Ashberry, Stephen Spender, Tomas Tranströmer and Miroslav Holub. Twenty-six participants from 21 countries were brought together to share their work at the World Poetry Festival held at Bharat Bhavan in 1989, perhaps the only gathering of its kind ever organised in the country. India certainly cherishes this literary connection. However, study of his influence on Indian poetry is still a due task. Nicanor Parra is indeed a jewel of Latin American poetry. Hope to see more pieces on Latin American literature.